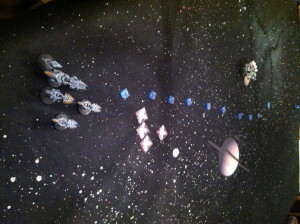 The Eldar fleet approaches Saturn. 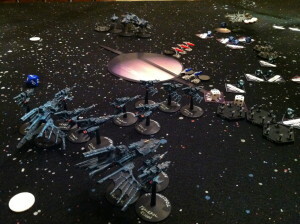 In today’s installment of the Jump War playtest reports, the Eldar Corsairs strike at another port, this time an Octan station orbiting Titan. The station will be defended by elements of the Terran Republic Navy. As usual, click on the pictures to see high-resolution versions. Erin’s plan, laid out in orange. Terry’s plan, laid out in blue. 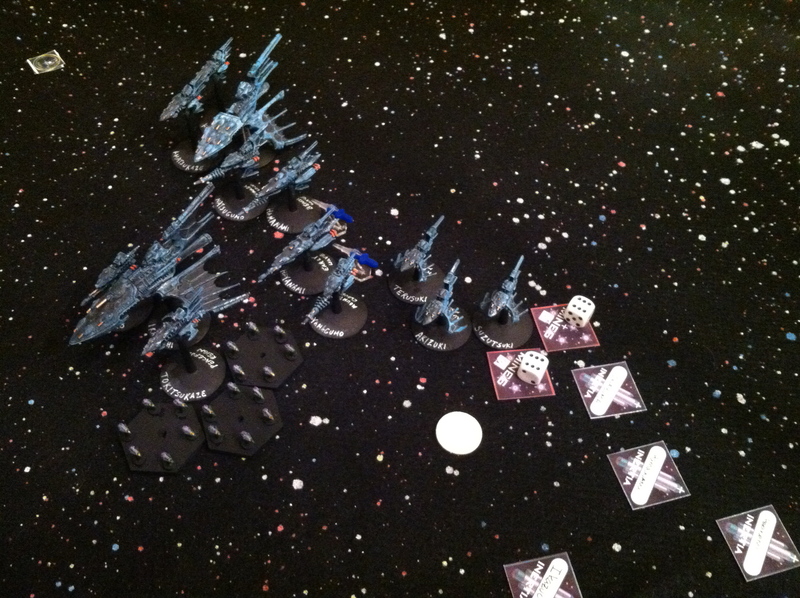 This is the first game with the refined gravity rules. They make the force of gravity stronger as your ships get closer to Saturn. Trying to mimic the inverse square rule. 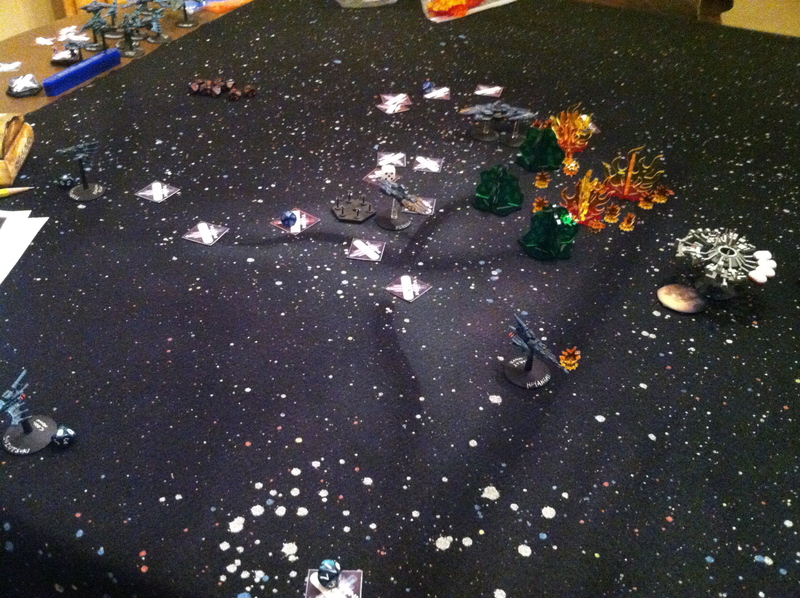 As usual, the first turn is all movement and ordinance launches. Task Force 17 thrusts to starboard, avoiding Saturn. Similarly, the corsairs thrust to port. 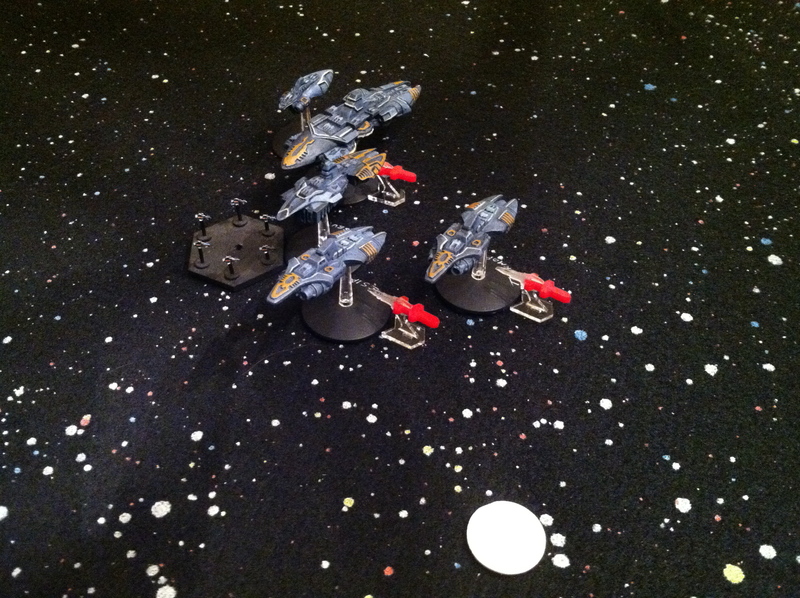 TF 17 launches missiles and fighters. 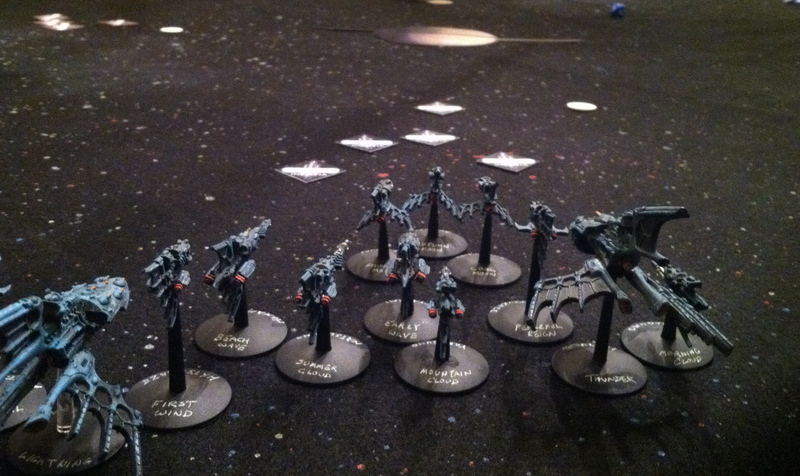 Some notes here: the missiles are from Litko, and the fighters are BFG Imperial fighters. Octan Station launches two strike groups. 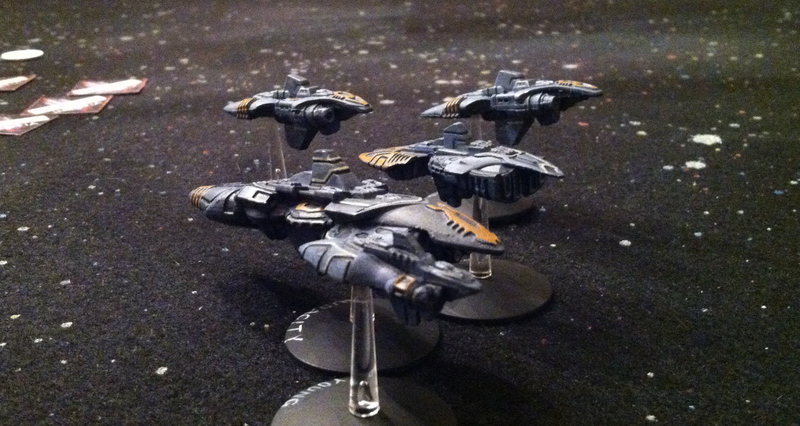 These fighters are BFG Imperial bombers. The moon in the foreground is Titan, created using a composite of a visible light picture, and a NIR (near infrared) one. The planet in the background is Saturn, in visible light. 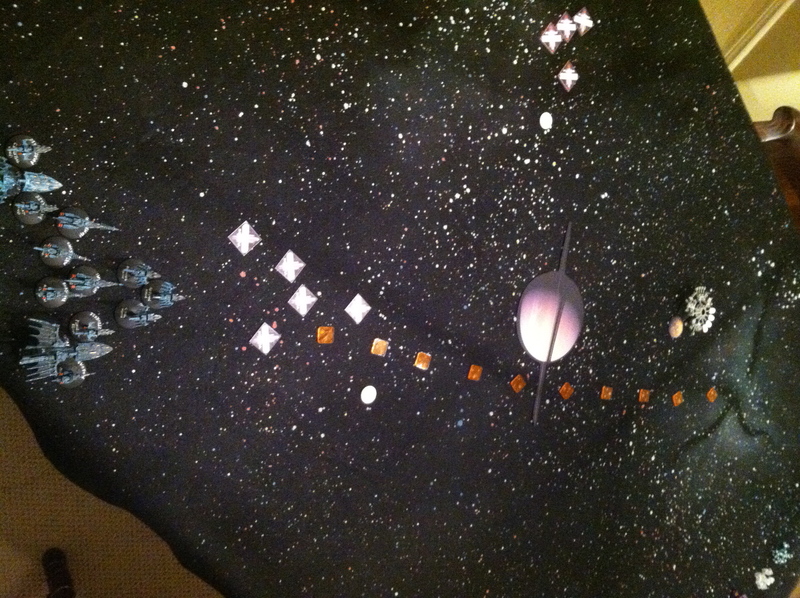 All original pictures are from NASA/JPL-Caltech/Space Science Institute. 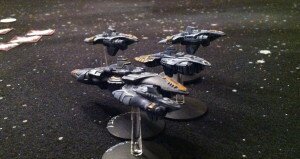 The Eldar launch all three kinds of ordinance. 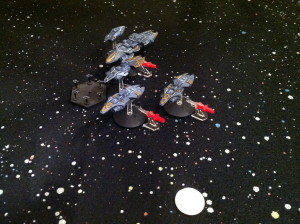 The fleets continued around Saturn, and began to trade laser fire at extreme range. The Eldar fleet presses forward. 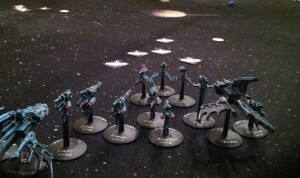 Octan Station’s strike groups clear Titan. 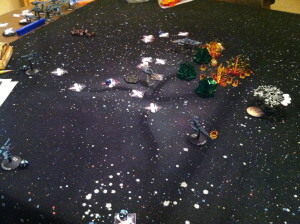 Not captured in of the pictures is the Eldar firing at the Terran strike groups at range. 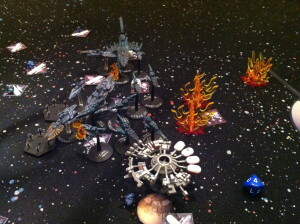 Fire on one group was ineffective, but the other group loses four of its fighters. At this point, I’m tempted to learn animation. I have a half page of notes describing the ordinance interaction, and no pictures. In the end, the Terrans’ missiles make their through the ordinance screen to attack Natsugumo, Hayanami, and Hananami. In all three cases, the ships’ point defense was effective. The battle now spotlights the fleets themselves. 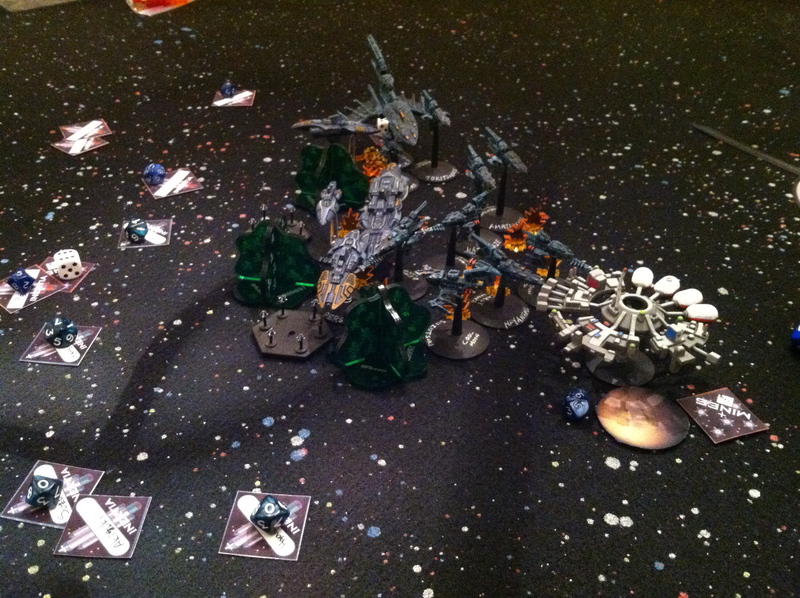 Even with all the fancy maneuvering, sometimes it just comes down to cutting. Inazuma and Alesia are gone in the exchange. 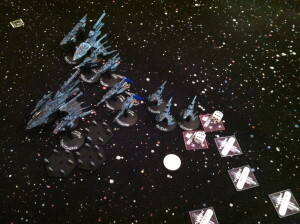 If the losses were just Inazuma and Alesia, Erin would be in good shape, points-wise. While Inazuma is a cruiser, the Eldar class is probably the lightest cruiser in the playtest. 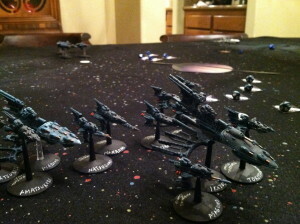 Conversely, most of the Terran destroyers are expensive (for destroyers), so Alesia is only 25 points less than Inazuma. 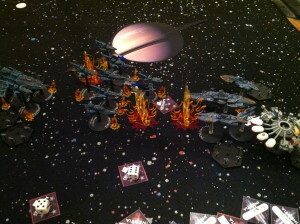 The problem is that the Eldar have also lost two escorts, and one of their destroyers (Hayanami) has been crippled by fire. 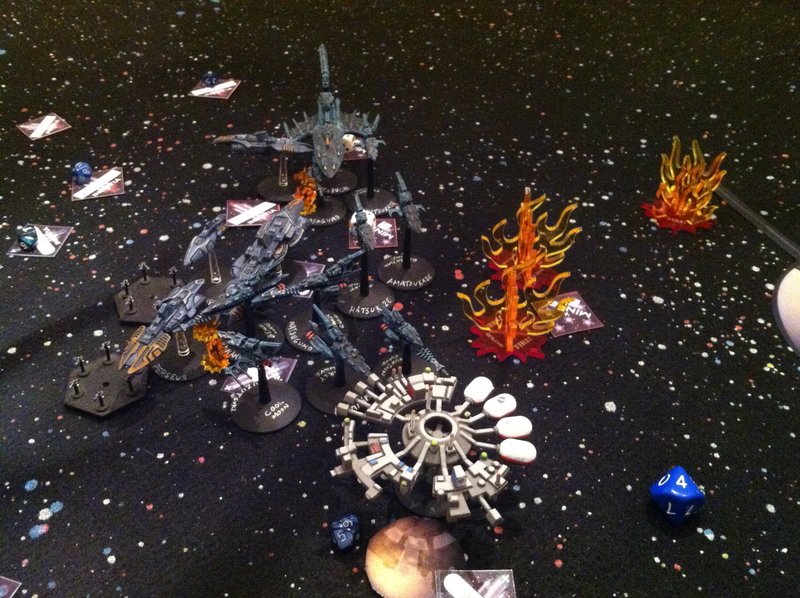 Another view of the carnage. 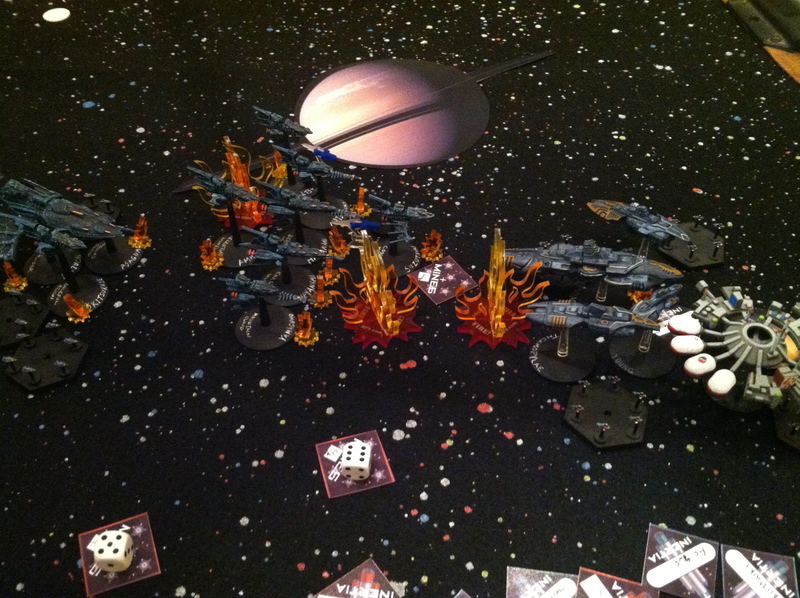 The fleets then intermingle, with fighters from Ikazuchi severely damaging Thermopylae. 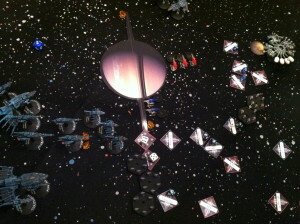 Thermopylae sideswipes Ikazuchi, and Hamanami sideswipes Perseus. 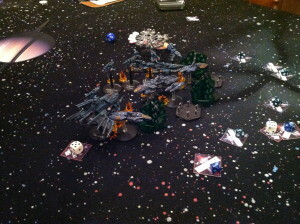 Ikazuchi manages to hide in Audacity‘s blind spot, but Octan Station can still reach the Eldar carrier. 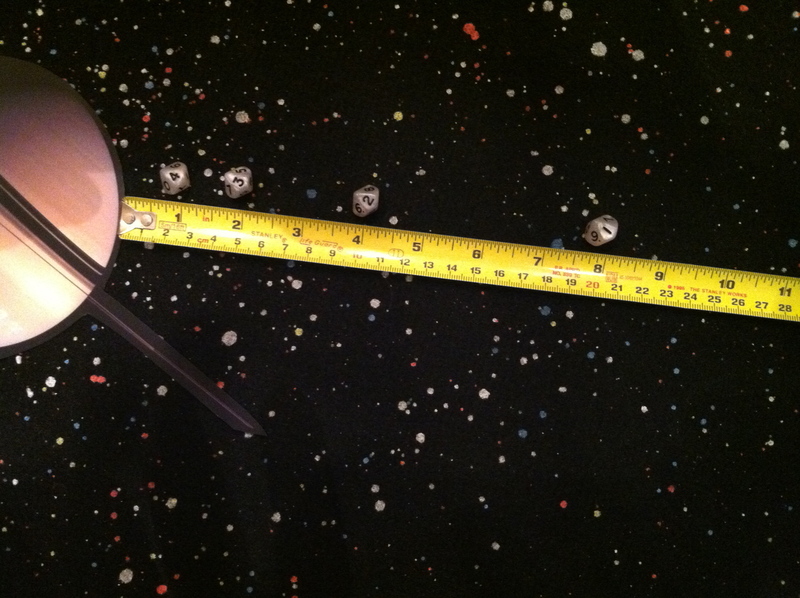 Momentum carries the battle away from Saturn. 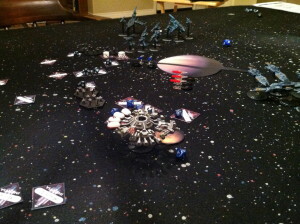 Debris from destroyed vessels distorts the survivors’ shields. Thermopylae has Ikazuchi in her sights. Between Thermopylae and Octan Station, Ikazuchi is done for — but not before launching fighters that would finish Thermopylae. Audacity destroys Hamanami, and Young destroys Hatsukaze. 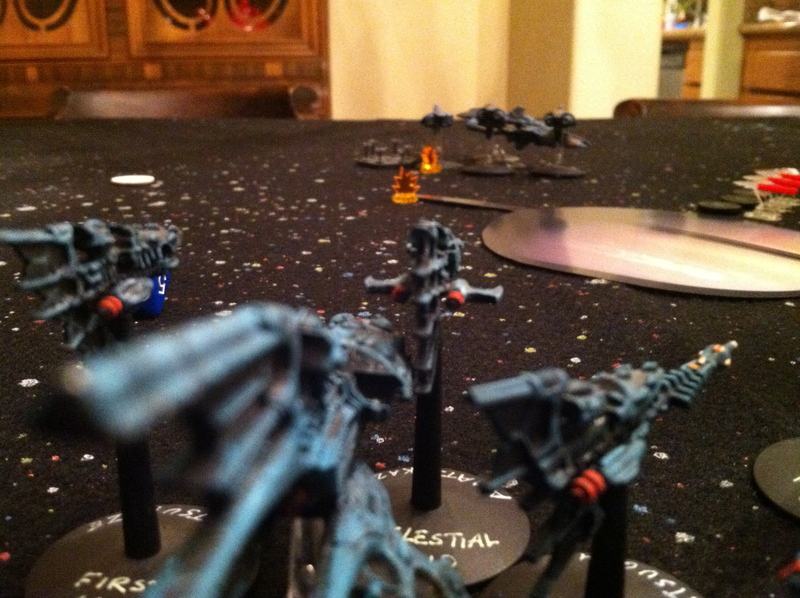 Just before the Eldar disengage. 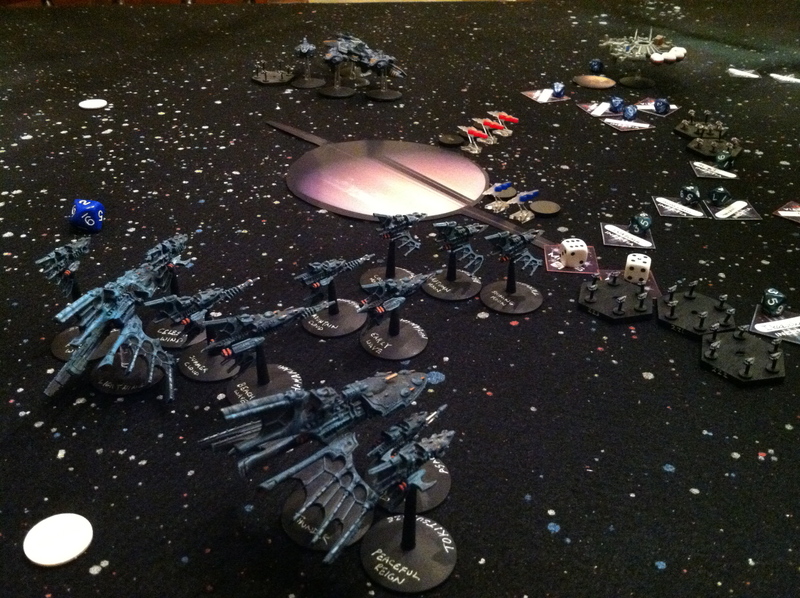 As has been typical of Port Strikes so far, both fleets suffered significant losses. 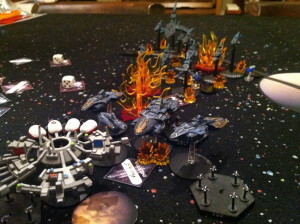 On the Terran side, only Young was unscathed (though Audacity was still combat effective). Thermopylae and Alesia were gone, and Perseus was disabled. 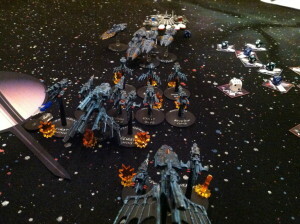 The Eldar were in worse shape. 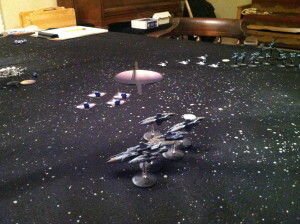 Both their cruisers were lost, along with one of their destroyers, and most of their escorts. While Erin did inflict damage on Octan Station, it wasn’t enough to offset her losses. Final Score: Terry 955, Erin 523. Another stunning victory for the Terran Republic Navy! 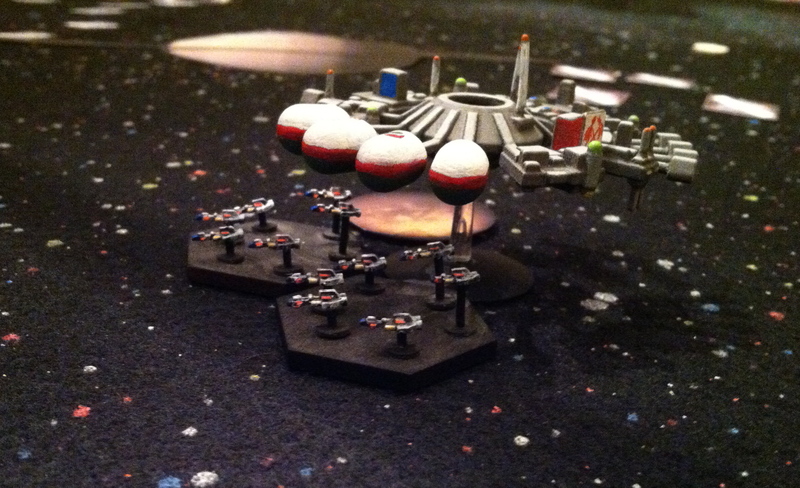 This was the first scenario with a ringed gas giant, and it made a huge difference in the course of the game. Erin ended up flying through the ring at precisely the wrong moment, which would have been bad even had her tactics been good. 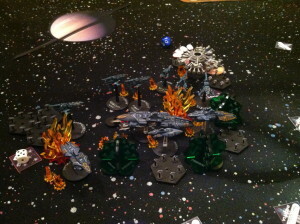 This entry was posted in Jump War and tagged battle report, bfg, cold navy, playtest, Shapeways. Bookmark the permalink.